The sports organisation has an enormous fan-base that spans the globe. With Cantemo Portal™ streamlining the media production workflow, the club can continue to engage with this audience across multiple platforms with ease, and make the most of its valuable catalogue of content. A major sports organisation with a global fan-base has implemented Cantemo Portal™ to help it better manage Terabytes of content and provide easy access for multiple employees. The organisation currently creates and provides content deliverables for content delivery partners, including broadcasters and for its own VOD service, as well as for other promotional purposes. It needed to aggregate over 300TB of content, dating back to 1985, across multiple storage pools. Due to the amount of content housed within its storage, and a lack of metadata support, the club’s media production department was finding it difficult to find relevant content quickly. It approached systems integrator, NMR, for a solution to its media management headache. With no archive solution in place and content residing in several pools, the club’s production team were wasting valuable time searching for content. On top of this, access to content was severely limited when not at an editing suite, preventing the casual viewing of files and the sharing of content with members in other offices. The previous solution used by the organisation did not facilitate metadata association, further complicating the search process and leading to a highly manual workflow. With no metadata support, important event-based data capable of signalling memorable moments within video footage could not be tagged, and were therefore difficult to identify. The biggest challenge for the club was managing legacy content dating back to 1985 comprising 300TB worth of assets. All of this content needed to be ingested, described with metadata and made available for use immediately. NMR, the systems integrator chosen by the sports club for its pedigree in video technology, implemented an integration with Cantemo Portal and Opta as the chosen solution. 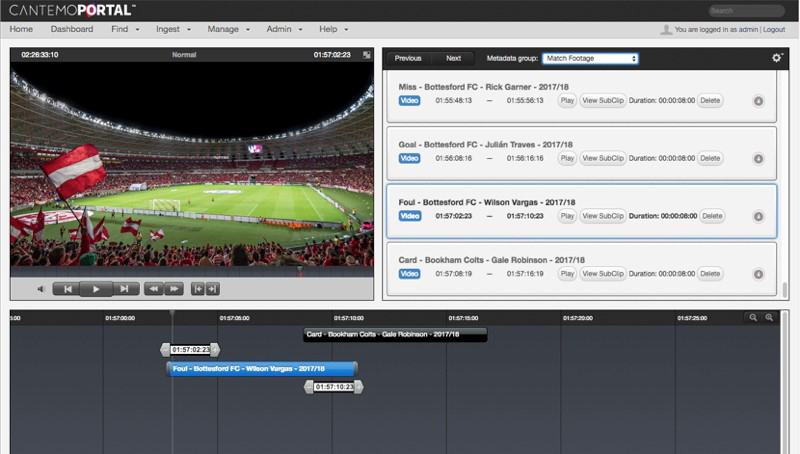 NMR developed an API integration to ingest dynamic Opta data and automatically generate subclips of game footage in the Cantemo Portal media management platform. 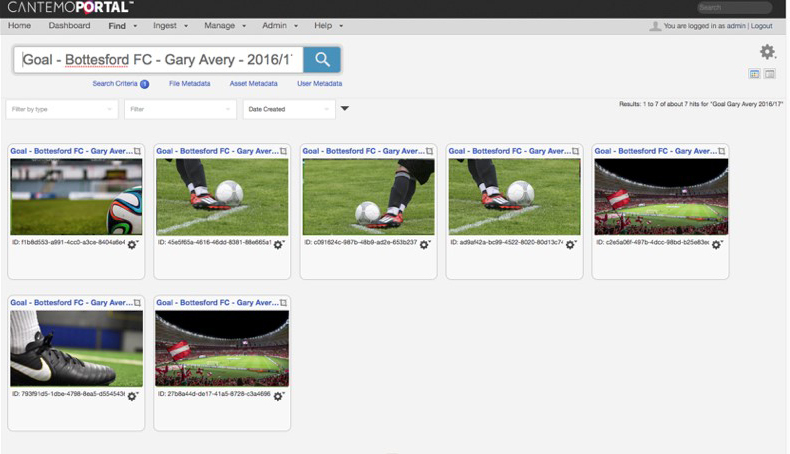 This means the club’s media production team can search within Portal for instant and relevant subclips. The integration of Cantemo Portal and Opta has provided the sports club with a unique solution. The data provided by Opta is easily aligned with assets housed within Portal thanks to the latter’s annotation tool. As such, the entire production of valuable subclips is automated and instant, ultimately saving time and resources. The Opta integration implemented by NMR allows events within games to be aligned with an asset via Cantemo Portal’s annotation tool. These events are marked automatically with timecode-based metadata, so it is known exactly when an event occurs within a clip. These events can be anything from fouls, tries, conversions, goals, penalties, aces, injuries, substitutions and everything in between. This data allows Portal to create instantly accessible clips and highlights which can easily be repurposed by the club’s media production team for its own VOD service, to supply to broadcasters, or for use on social media and for other marketing materials. Portal’s event-based metadata support also makes it easier for the club’s media team to find and identify relevant legacy content – a useful feature given that the club’s archives contain footage dating back to 1985. 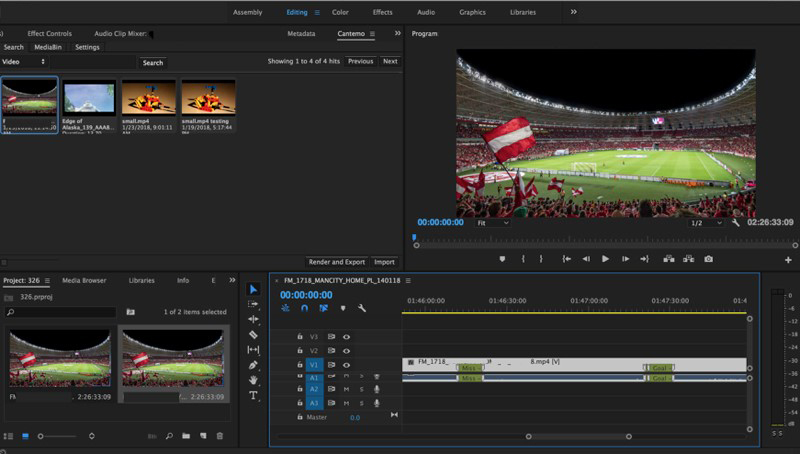 Thanks to an existing integration between Cantemo Portal and Adobe Premier Pro, subclips created by Opta can be sent to the Adobe Premier Pro CC timeline for further editing. This significantly shortens the production time of valuable assists. An important aspect of this deployment was enabling better visibility of content to speed up the process of retrieving assets for use. Portal’s sophisticated metadata support is central to enabling this. By applying intricate metadata to the club’s content, the entire media library is inherently more searchable. Not only this, but Portal’s metadata support also allows users to easily add and modify metadata associated with specific files or groups, and it enables inherited metadata. This means that any metadata associated with a parent asset is automatically inherited by a child asset, and any other items within that group. Within Portal it is also possible to establish rules based on certain criteria, which can automate workflows. This can, for instance, enable a senior team member to approve an asset which triggers a ‘view only’ rule, and does not allow further edits to be made. The ability to watch content via low-res proxies further quickens the content search and production process as there is no need to wait for Gigabytes of files to arrive. Portal has also reduced data errors by constricting the amount of free text users are allowed to input. This has instead been replaced with dropdown boxes to maintain the discoverability of content. Limited access to content when not at an editing suite is no longer a problem for the club. Being web-based, the production team can access the same content and functionality housed within the Portal system at any time, wherever they are, with just an internet connection. Content can even be access on a mobile phone if needed, due to Portal being platform independent. Cantemo Portal enables the organisation’s media production team to save valuable time and resources searching for content, which in turn speeds up post-production workflows, generating a higher ROI for the club and a more efficient editing process for the media team. The result is a catalogue of always-available, and highly valuable assets.